In what could be an attempt at taking on Bennett, Coleman & Company Ltd, the country’s largest publisher and owner of newspapers like The Times of India and The Economic Times, six rival broadsheet dailies have formed an alliance to bring their advertising might together. The six are English dailies the Hindustan Times, The Hindu and The Telegraph; their sister publications The Hindustan and The Hindu Tamil; and Ananda Bazar Patrika. The alliance, One India, will allow advertisers in two top ad categories -- fast-moving consumer goods and banking and financial services -- to access the six publications through a single point of contact and enjoy a certain cost advantage. The biggest advantage will be that the advertisers will be able to benefit from these newspapers’ combined reach. The six together have a readership of a little more than 60 million. In comparison, BCCL’s total readership strength according to the Indian Readership Survey data, is only half that number. “The idea behind One India is to provide an unduplicated reach like never before, along with a single-window service, to invite non-print and infrequent print advertisers to experience and profit from the significant benefits of print advertising,” said Benoy Roychowdhury, executive director, HT Media Ltd.
BCCL CEO Ravi Dhariwal was dismissive of the rivals’ initiative. “They have tried this in the past and are doing it again in a tweaked way. Broadcasters have routinely come together to form content aggregation platforms so that they can bundle channels. This gives them the distribution clout to negotiate better with multi-system operators, who charge significant amounts in carriage fees for airing channels on their platforms. The Telecom Regulatory Authority of India had come down heavily on the content aggregators (Media Pro, The One Alliance and IndiaCast UTV), since their combined market share was nearly 60 per cent. 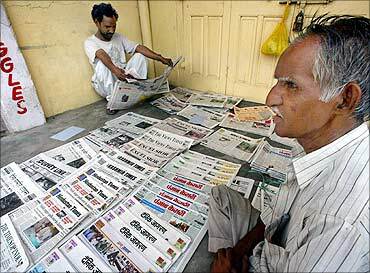 The alliance of the six newspapers is unlikely to draw concerns from the Competition Commission of India, as it is an operational initiative, and not a joint venture. It is unlike broadcast’s The One Alliance (Multi Screen Media and Discovery Networks) or Media Pro (STAR India and Zee Entertainment Enterprises Ltd). Also, the newspapers will continue to sell ad space individually, too. The only difference is that the advertisers wanting to advertise in all six will find it easier. Additionally, the cost of buying print ad space through the platform will be lower than purchase in each paper individually. Advertisers and media planners appear to be excited about the initiative. Team Unilever leader for South Asia, Amin Lakhani, the man who manages the media buying for the FMCG giant in India, Pakistan, Bangladesh and Sri Lanka, said: “This is a welcome move. “The platform offers reach, convenience and value. Allied Publishers is said to be watching how the One India alliance shapes up. The alliance, according to informed sources, took a year and a half to fructify. Apart from Hindustan Unilever, the country’s largest FMCG company and said to be considering associating with One India, other companies like Marico, Amul, Kelloggs, Godrej Consumer, ICICI Lombard and Morgan Stanley have already come on board. Jehil Thakkar, head of media & entertainment, KPMG, said: “The platform has been formed more from an operational convenience point of view. “In that sense, there should be no problem with regard to competition norms. “Also, there are enough players in each of the markets these papers operate in. “What the alliance will do is give the publications a slight competitive edge in their regions. R S Sodhi, managing director of Gujarat Co-operative Milk Marketing Federation, which owns the Amul brand, said: “The platform is about combined space selling, which is advantageous to us. The launch of One India has come at a time when the print industry is set to see a spike in spending, thanks to the coming Lok Sabha elections. According to the KPMG 2013 Media and Entertainment report, the industry grew at a compound annual rate of 8.5 per cent in 2013 to touch Rs 243 billion. Regional markets performed exceedingly well on the back of steady advertiser spends, the state election impact and new launches. The prediction for the current calendar year continues to be optimistic, with the regional print media growing faster due to the coming elections. This platform also helps the English newspapers leverage the growth of the regional publications, instead of competing with them for ad rates and clients. Beyond politics: FM wants to edit a newspaper!